Meatloaf is on the menu today! For some, the word meatloaf induces a nose-wrinkling response and for others, a huge grin. 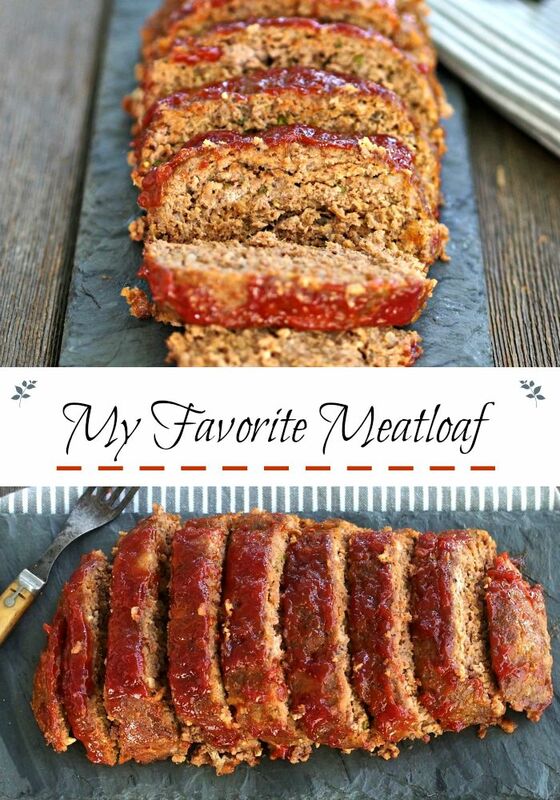 I have no idea if meatloaf makes your lips curve toward the heavens or turn down toward your toes, but I’m glad you’re here and hope you give My Favorite Meatloaf a try. 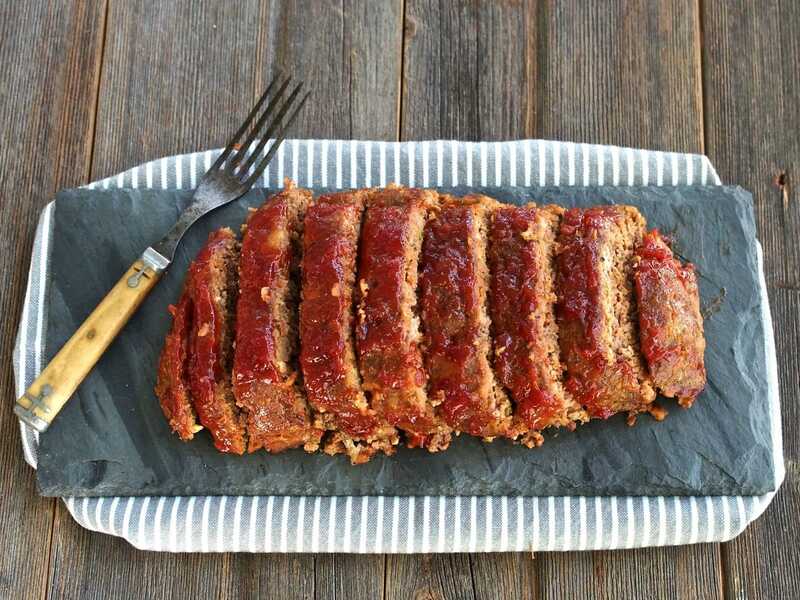 Growing up, I loved my mom’s meatloaf with the glossy, brown sugar, ketchup glaze, and I never dreamed anyone existed who didn’t like meatloaf until I met my husband, Jeff. Since then, I have met others who claim a dislike of this homey dish, but it is my theory they just haven’t tasted great meatloaf. Jeff’s mother was a terrific cook, but her meatloaf wasn’t one of her top 100 best recipes. 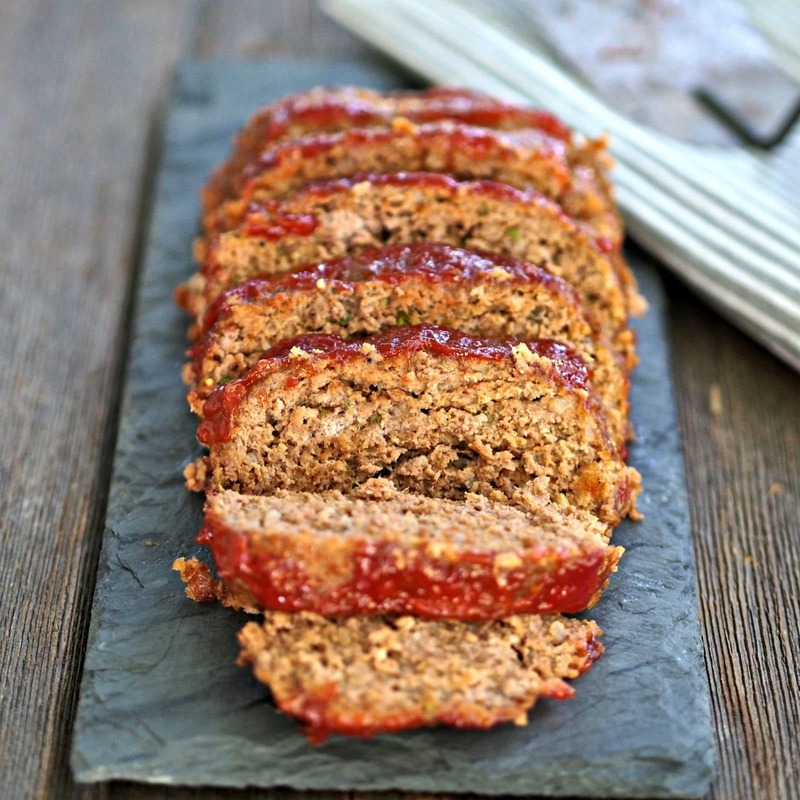 My Favorite Meatloaf is similar to my mom’s, but is kicked up just a notch. The few changes I’ve made are these: my meatloaf has sautéed onions, a hint of heat, and milk is used instead of tomato sauce to add moisture. I have also added cider vinegar to give the glaze flavor balance. No matter the ingredients chosen, the most important tip to remember is not to overwork the meat mixture. If overworked, meatloaf will become tough instead of tender. The mixture should hold its shape and feel plump and slightly wobbly instead of packed and firm. So, if you are wearing a meatloaf-inducing frown, it’s time to turn it upside down. 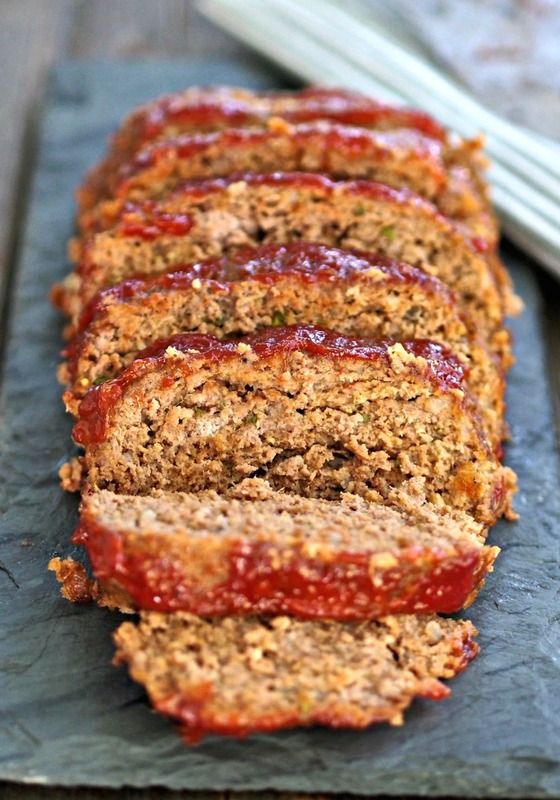 Come on, be brave and make My Favorite Meatloaf. If you taste it and still have negative thoughts, give it away as a gift. The recipient will become your new best friend. PS – My Favorite Meatloaf makes great hot sandwiches when sliced and served on butter-toasted (on the inside) French loaf bread. Simple and delicious whether served as an entree or sliced and placed on toasty buns for a great sandwich. This recipe impresses every time. Heat butter and oil over medium heat in a large cast iron skillet. Add chopped onion and sauté until translucent. In a large bowl, combine onion, milk, ketchup, Worcestershire Sauce, kosher salt, black pepper, red pepper flakes, parsley and eggs (add steak sauce now, if using). Mix well. Add breadcrumbs and ground chuck. Gently mix to blend. *It is important to NOT over-work the meatloaf mixture. Mix it just until mixture holds together and can be shaped. Shape the meat mixture into one large or two smaller loaves and place them back into the skillet to cook. 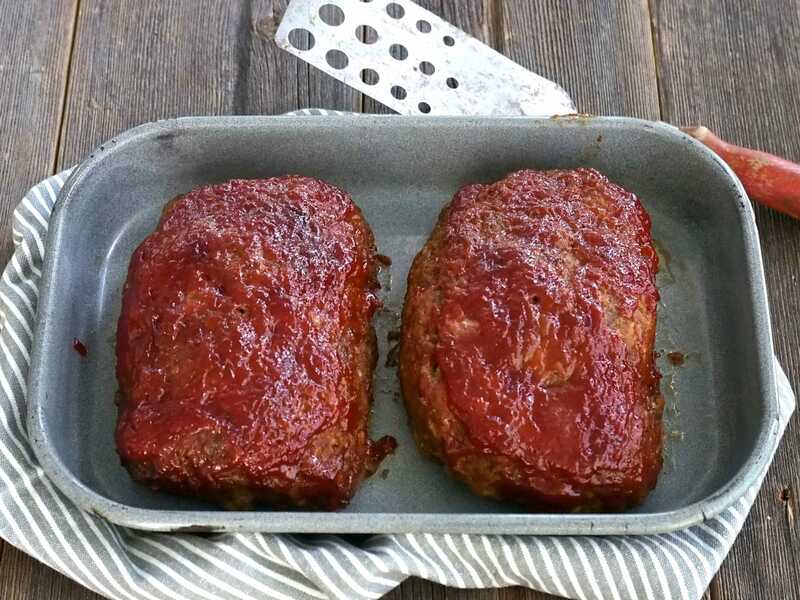 Spread sauce (reserve ¼ cup) evenly over meatloaf. Transfer skillet with meatloaf to preheated 350F oven and cook 45 minutes. After 45 minutes, pour reserved ¼ glaze over meatloaf and cook another 15 minutes or until internal temperature reaches 160-165F. 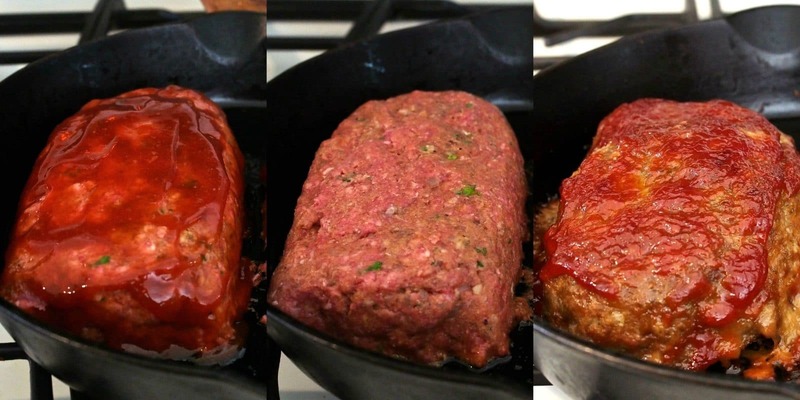 Remove meatloaf from oven and turn oven to broil. 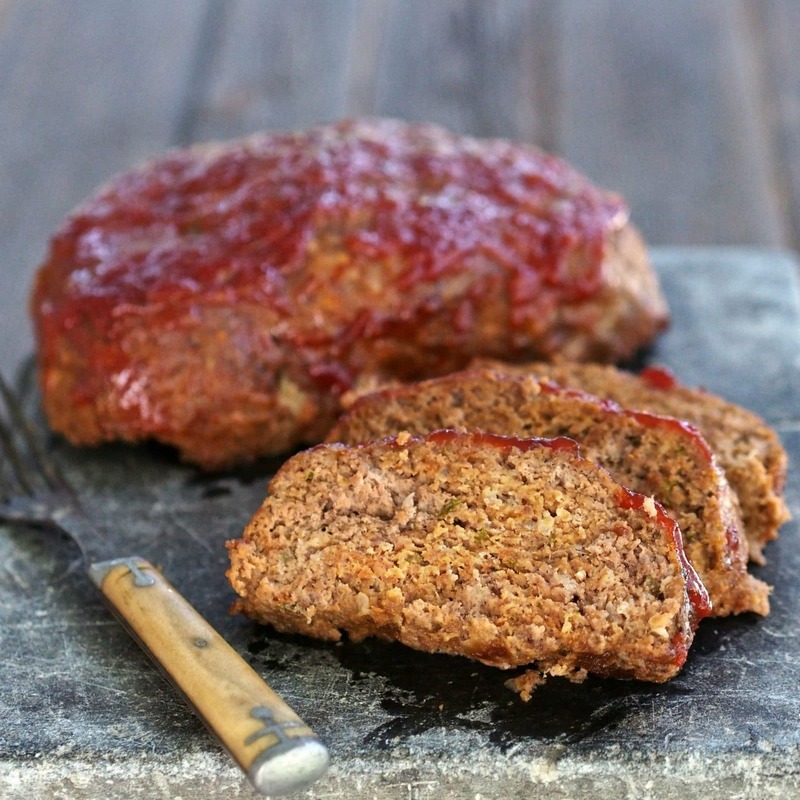 Place meatloaf under broiler just until sauce caramelizes a little, 1-2 minutes. *Watch closely. Combine ketchup, vinegar and brown sugar - mix well. Yum! We just had meatloaf last weekend. 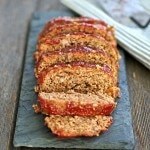 Everyone loves it and your recipe is similar to mine, except I use oatmeal instead of bread crumbs. Comfort food for sure! Great recipe! !